Happy Friday and Happy Spring!! Just a quick reminder of our upcoming meeting on Thursday, May 7th. Please let me know if you will be attending. 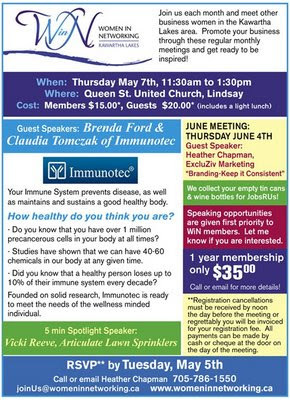 Our guest speakers will be Brenda Ford and Claudia Tomczak of Immunotec and our 5min Spotlight will be Vicki Reeve of Articulate Lawn Sprinklers. Full Details attached. A small door prize is always welcomed and don't forget to bring your tin cans and empty wine bottles to help out our friends at "JobsRUs"
WiN member, Cheryl Evans of Sunny's Massage Therapy will be hosting a Spring Open House at her clinic on Saturday, May 2nd from 10am to 3pm located 228B Kent St. If you get a chance stop by, there will be a variety of product and service demonstrations, including WiN member Gloria Broad of Mary Kay and others. I look forward to seeing everyone! Please pass this flyer along to anyone you think might be interested in joining us.